Origin and Habitat: Northern Argentina, Salta, above Quebrada Escoipe, at an altitude of around 3000 metres above sea level. 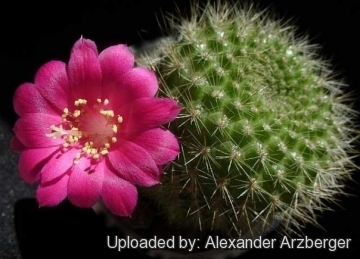 Description: Rebutia violaciflora is another lovely variety that features golden yellow spines that grow 25 mm long and a yellow-green, clump-forming, globular body. It carries large, funnel-shaped, light-violet blossoms in the early spring. Rebutia violaciflora is one of the morphological or local forms of Rebutia minuscula, but the differences are in reality very minimal and the two plants are not readily distinguishable, if not flowering. More likely they are one and the same species, but it still has a value for a collector because they identify plants with particular characters. These light-violet flowered plants found in our collections, are almost always raised from selected self-pollinating strains and autogamy preserve this character in pureness, but in natural populations the colour of flowers ranges from red to purple, to violet and specific colouration such as violet is often the result of artificial selections. Stems: Hemispherical or sometime globular, small usually less than 20 mm diameter (often larger in cultivation), usually solitary and depressed at apex. Deep yellow green. Ribs: Completely divided in flat, rounded, spiralled tubercles. Areoles: Round, round, 1 mm diameter, yellowish tomentose. Spines: About 20, bristle-like, stiff, radiating, ranging from 3-25 mm in length. There are also some central spines, hardly distinguishable and somewhat stronger. All are deep golden-brown, tan or brown. Flowers: Funnel shaped, 30-35 mm long, 25-30 mm wide at top, light violet-red and self-fertile. Ovary, about 3 mm wide crimson colored, with brownish triangular scales, c. 1 mm large, with very short woolly felts in their axils. Floral tube briefly flared, about 10 mm long, c 2 mm in diameter at the base, 7 mm wide above, brownish pink, with 2-6 mm long and 1-2 mm wide, reddish brown, naked, pointed scales. Outer perianth segments acutely lanceolate with spiny tip, purplish pink; inner perianth segments oval lanceolate with spiny tip, 15 mm long, 6 mm wide, purple-pink. Filaments white, 5-10 mm long, anthers small, spherical, yellow. Pistil, 20 mm long, thin, reddish pink to whitish, with five yellowish to whitish lobes, 2-3 mm long. Fruit: Spherical, about 6 mm wide, orange-yellow, later browning, drying and cracking irregularly. Seeds: Oblong, about 1 mm long, with shiny, black, finely warty testa and a large white hilum. 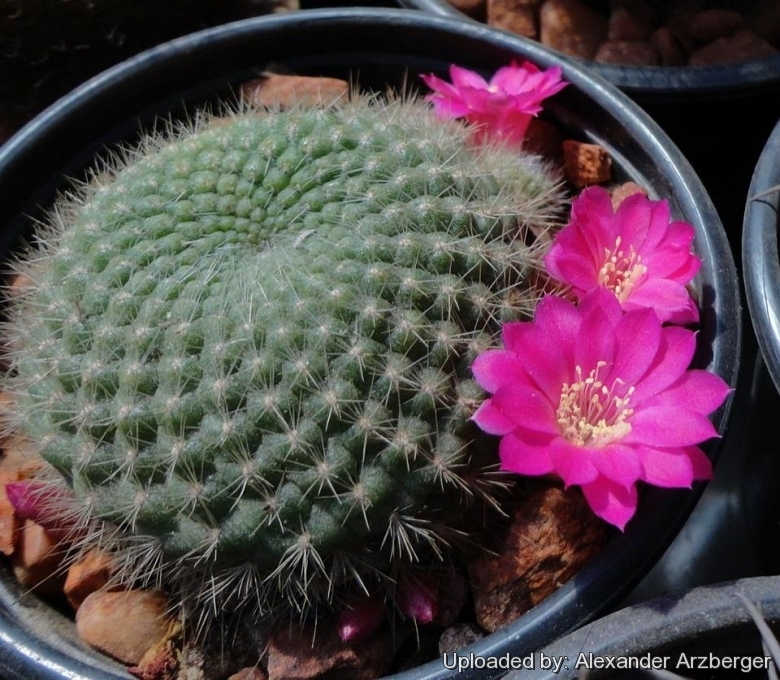 Cultivation and Propagation: Rebutia violaciflora is a summer grower species that is easy to cultivate and recommended for beginners. 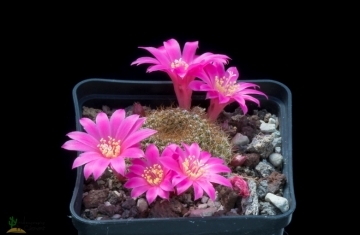 The whole Rebutia minuscula complex has delightful flowers and the plants remain compact, and clumps can easily be managed by division. Another advantage is that the plants are very cold hardy in Winter if kept dry.